The audio's only plays in a DVD player or computer as it is 8GB. It cannot fit on a CD, if we burned it to CD it would take over 12 disc's. You can order and donate for the USB. PLEASE READ WHAT YOU ARE ORDERING - THE FIRST AUDIO TITLED THE TORAH IS MADE UP OF THE FIRST 5 BOOKS OF THE HALLELUYAH SCRIPTURES. THIS ALSO COMES WITH 3 CHAPTERS FROM THE BOOK OF JOHN. THE SECOND AUDIO IS 14 BOOKS OF SHAUL. YOU CAN ORDER BOTH OR JUST ONE OF THE AUDIOS. Truly, this is history in the making as it has never been done before with restoring the Names of the Father and His Son. The first 5 books of the first Covenant with 3 chapters of Yohanan/John has been fully completed after 2.5 years. The books of Shaul have now been completed and we are offering them on the order form. These are a dramatization with many voices bringing the Word of the Father and His Son to life with amazing sound effects which were created for this special project. The music has been hand written for the audio and no wordly music has been used. It is the most anointed project in audio and is the first of it's kind. There is nothing greater in this world than His Word and it is such an honour to be chosen for such a job, we all praise and give esteem to the Father and His Son for they have done an amazing thing. These dramatizations have gone out all over the world to places and countries that have forbidden His Word and where we could not dream of going. It will melt the most hardest heart. It is so powerful and within listening to a couple of verses you will weep. It cuts so deeply into ones heart. These took many years to put together and there was a huge amount of work behind it. A number on the HalleluYah Scriptures team worked full time around 12 hours sometimes more daily and gave it all they had to make this happen. It was not an easy job and if you watch the video at the bottom of this article you will see the price that was paid to complete this very urgent and important project. When the Ruach gave the vision a number of years ago for this audio, we were to count the cost, it was revealed to us that this was prophecy. The Ruach revealed also that the project would be under huge spiritual attack for the enemy hates the Father's Word and does not want anyone to have this truth or know the Names of the Father and His Son. We knew this cost and proceeded and the Ruach was not wrong. Please pray daily for this project as the Father and His Son are in a huge battle over their Word the HalleluYah Scriptures. Proclaiming The Names of the Father and Son to the world. There is nothing greater in this world than His Word and it is such an honour to be chosen for such a job, we all praise and give esteem to His Name for this. The dramatization audio will go all over the world to places and countries that have forbidden His Word, many underground groups will gather to listen to this audio. This precious gift will be listened to daily by tens of thousands of people all over the world. When the hard times come and the internet is no longer around, people will have this audio to listen to and come to know His Name and Torah, halleluYah! Please keep this project in your daily prayers. We are seeking brothers and sisters all over the world to order the audio and get it into as many hands as possible to those who are not aware the Father and His Son have Names. There is nothing more important than the true Word and that is what the HalleluYah Scriptures is, it was inspired by the Father and His Son for a time such as this and it is the only version that bears the true Author's Name on the cover and inside- no man's name or credits are in the HalleluYah Scriptures for the The HalleluYah Scriptures is the purest and the closest to the Hebrew than any other version in English. No footnotes or man's doctrines just the pure Word as the Father instructed. Our prayer is for the Father's children all over the world to come forward and take the time to order the audio and share them in their town, city, state and country. Most of you know the world is in desperate need of truth and many are lost and in such pain, suffering and they need answers and His Word has all the answers that are needed The audio can go into places and countries that most of us cannot go to. Please help us to spread the audio and reach as many as we can. 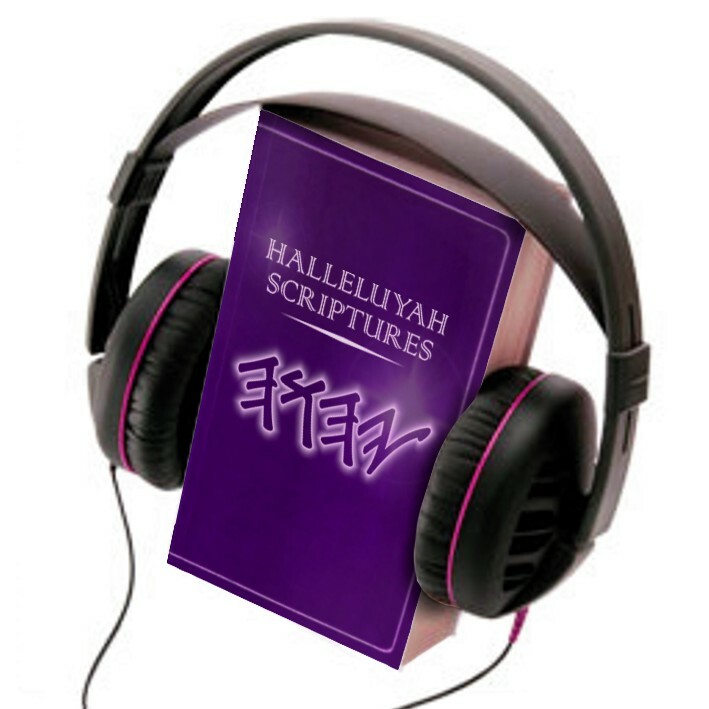 The Name Note: The vision to complete the audio of the HalleluYah Scriptures was given over 2 years ago. We prayed and fasted about what Name to use for the audio and this is what held up the project in the beginning. Some people use Yahweh and others Yahwah and a number will not listen to an audio with Yahweh and some will not listen to an audio that features the Name Yahwah. We felt through prayer the only option was to do two audios to cover both Names so that people have an option of which one they want to listen to. We do not want to bring contention to anyone and feel we have tried our best to come to this conclusion on the Names. We could have used the short form ‘Yah’ when transliterating YHWH but the Ruach put it on our hearts not to do this as it would be bringing His Name to nothingness (as people will not know His Personal Name at all) and we do not want to do this as we would be in violation of His Torah. May we continue to keep in mind that all of us are coming out of Christianity and other forms of falsehood, we are all learning bit by bit as the Father wills and leads… may we be patient and compassionate with one another as the Father is with us. HalleluYah Scriptures team has done their part and dedicated over two years to this project and we cannot do it all ourselves and need the Father's children to stand up and help us to get this around the world. We need pray and or fasting for the project, we need brothers and sisters to take copies and share them with those who are not aware the Father and His Son has Names. Please think about our brothers and sisters who are in desperate need of this audio and truth. We want to be able to give to all that ask for a copy but cannot do this without the donations for burning them and packaging and mailing them out. Without your support, we cannot do this work. We can only give freely if we have others donating. All donations to the audio project will go to burning the audio and sending them out. Over 150,000 of these have been produced with most of them being sent out all over the world. A special thank you to all the HalleluYah Scriptures supporters who have continued to support this most urgent and important project. You have touched and changed lives all over the world. We have made a sample book of Ruth and a chapter of Shemoth below to give you an idea what the whole of the audio will sound like once it is completed. We want to share with you what we are trying to achieve with His Word. Listen with your headphones and have your heart touched. 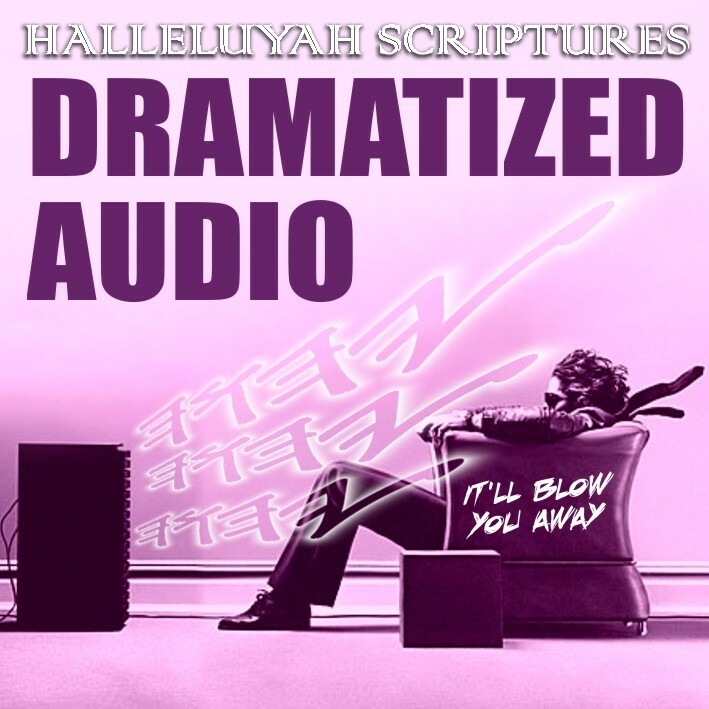 Please Note: The HalleluYah Scriptures Audio Dramatization is on DVD as it is near 8GB in size and cannot fit on a CD, in order for us to fit it on a CD we should have to produce 12 odd disc's. You can play it on your computer or DVD player. HalleuYah and thank you. The HalleluYah Scriptures Team Someone has to tell the world for they do not know and how will they know unless the Father's children stand up and do their part. You can now order the USB stick with the HalleluYah Scriptures audio on it. The cost only for the USB stick is around $20.00 each for USB. We offer this at cost so that we can raise funds to burn more disc's to give away freely to those seeking truth and have no idea about truth and for those who cannot afford. Please consider donating to help brothers and sisters who have no means to enjoy the HalleluYah Scriptures audio or be able to share this special audio for those who are not aware the Father and His Son has Names.